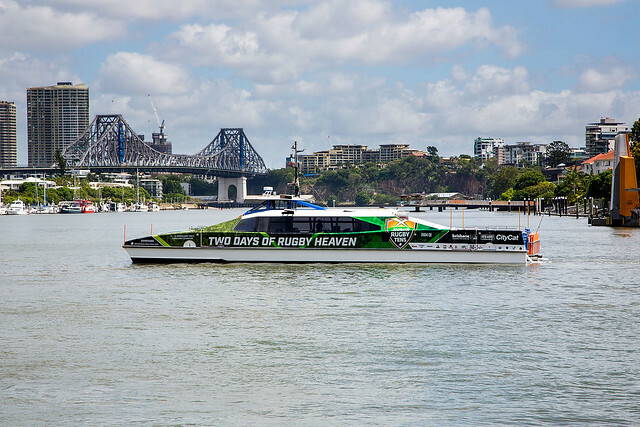 Brisbane City Council's commemorative CityCat and bus designs aim to increase community pride, acknowledge our city's success stories and commemorate historic events. The new wave of decorated CityCats include a range of sporting and event wraps. Queensland Reds – Queensland rugby union. CityCat services celebrated 20 years of services in Brisbane on 4 November 2016. Council unveiled a specially wrapped 20th birthday CityCat to mark the milestone on 4 November 2016. The colourful birthday theme was contributed by a CityCat staff member. Council’s public transport fleet helps residents and visitors commemorate the Anzac centenary. A bus and CityCat each received a distinctive wrap to mark the historic event. The bus and CityCat have complementary liveries honouring Brisbane’s First World War heroes. They recognise the contribution and sacrifice of Australian and New Zealand troops. The bus artwork commemorates James and Alexander Patterson from Toowong. They were eighteen-year-old twin diggers who served at Gallipoli in 1915. James and Alexander were two of five brothers enlisted between 1914 and 1918. They served together in Gallipoli, sharing the same dugout, and in northern France at Bois-Grenier. James was wounded and evacuated on 9 August and Alexander was killed during the battle of Mouquet Farm three weeks later. Alexander Patterson was later awarded the military medal for ‘conspicuous bravery’ in November 1916. The medal was for his role as company runner. He ran messages day and night to battalion HR, even under heavy fire. Brisbane artist Debra Hood designed the wrap for the Team Brisbane CityCat. Debra won the Brisbane CityCat design competition in 2016. Her design depicts Brisbane as a vibrant and colourful city. It shows a collection of iconic ‘Queenslander’ style homes that abound and embrace the Brisbane River. Her design’s ‘dotty’ style reflects the natural confetti created when Brisbane’s jacarandas and poinciana trees spill their foliage. The Brisbane River inspired Debra. It provides a life stream of beauty and a uniquely relaxed urban identity. The distinctive G20 livery celebrates Brisbane’s role on the international stage. Brisbane was the host city of the G20 Leaders’ Summit held in 2014. The CityCat was created in conjunction with the G20 Taskforce. The livery features the G20 logo designed by Indigenous creative agency Gilimbaa. Logo artwork was created by an Indigenous artist, Riki Salam. The vibrant colours of the G20 logo represent a weaving together of nations, a gathering of leaders and the journeys they will embark upon throughout 2013-14. The triangle shapes represent the members, invited guests and international organisations that attended the G20. The logo pays tribute to Australia’s Aboriginal and Torres Strait Islander population and their ancient cultures. The inspiration comes from the traditional Torres Strait Islander weaving patterns of the coconut palm leaf. The pattern connects shapes, representing the Aboriginal Rainbow Serpent legend. It forms a track through the discussions and events of the host year and reflect the G20 journey. The weaving also forms a fish which represents the Dhari, the traditional Torres Strait Islander headdress. The fish is a reminder of the connection between the people and the sea – the source of life and food. The colours represent the diverse landscape of Australia. From red desert sands to golden beaches and lush tropical rainforests. The colours also represent economic sectors such as resources, infrastructure and manufacturing. The Spirit of Brisbane is a tribute to this great city, its people and their community spirit. The livery celebrates Brisbane's ‘mud army’ that came together to help clean-up after the 2011 floods. The interior depicts a montage of photographs of the clean up performed by some 25,000 volunteers during the disaster. It also includes the flotilla of vessels that commemorated the return of the iconic CityCats and ferries after the flood. The commemorative wrap has a special colour scheme. Blue represents the sky and river, green reflects new growth after the flood and maroon for the Queensland spirit. The yellow sunbeam represents the sun that shone across the sky as Brisbane reclaimed its city. Judy Watson (Waanyi language group) is a leading contemporary artist. Her artwork Shoal (1998), forms a net that wraps Gootcha. This work relates to passages of water, the pulsating heart of the city and what is caught within the net: eel, Brisbane River cod, crab, turtle, mullet, guard fish, shellfish. The lines, like the scales of a fish or the reflection of light, also mirror the water as the currents sweep along the river. The INAS Global Games 2019 decorative wrap aims to promote the games to be held in Brisbane between 9-19 October 2019. The games are run by the International Federation for Athletes with Intellectual Impairments and consist of an international sporting event and convention. They are the world’s largest elite sporting event for athletes with an intellectual impairment, held once every four years. The games feature nine international sports including athletics, basketball, cycling and tennis. They will attract more than 1000 qualifying athletes from more than 75 member INAS nations. There will also be an additional 2600 coaches, family and friends. View our gallery of wrap images in the slideshow. Alternatively, view them in the 'Commemorative CityCat and bus designs' album in Council's Flickr account.